Translucent high-density polyethylene resists acids and caustics. 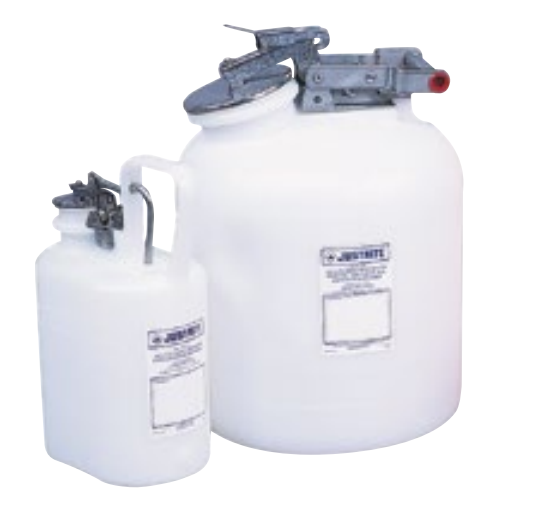 The 2- to 5-gallon (7.5- to 19-L) sizes have fixed position on handle, which allows lid to stay open for easy filling. Spring-close cap provides a tight seal. Flame arrester-free spout allows quick pouring of non-flammable corrosives. Oval containers have trigger handle for one-handed pouring and make the most of storage capacity.